The Gloves are a cutting edge experimental gestural music ware being developed today for the purpose of Imogen Heap’s studio and stage work. Imogen Heap was frustrated by the limitations of only having two hands to orchestrate her on-stage performances. She often dreamt of a bodysuit that would allow her to interact with various aspects of a musical performance. That dream quickly moved towards a reality after visiting the MIT Media Lab. 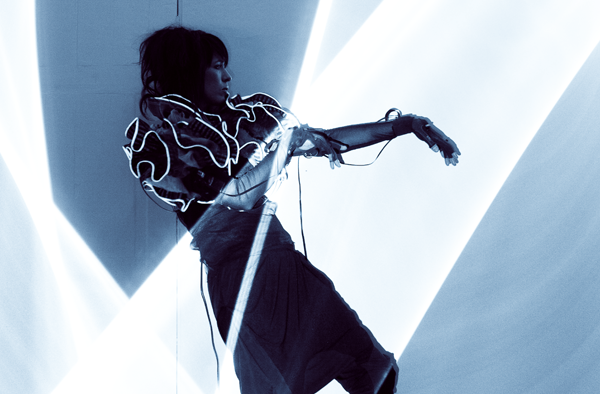 The Gloves Project was born out of conversations with various members of the team about how to improve functionality for Imogen Heap's studio and stage work. Here are a few videos of Imogen Heap discussing and demonstrating her gloves: WIRED 2012, Dara Ó Briain's Science Club, and Art and Humanities Research Council (hour video; demo at 13min). This is a pretty amazing use of etextiles in drastically changing an artist's ability to create and interact with her art. Check out the Gloves Project for more information. Hannah Perner-Wilson even created an online tutorial to build your own gestural music gloves including a SparkFun wish list of parts! nice looks with the perfect shot! This is a pretty amazing site! Thanks for sharing..